If you like good acoustic music, just show up at Austin Java at 12th and Lamar (north) at 8 pm on Thursday, October 18th for the THIRD COAST MUSIC SONGWRITER SHOWCASE -- which is of course the revival in small portions of what used to happen every night at the old Chicago House music venue. This week's featured performers include Miss Shelley King, the fabulous Darcie Deaville, and Tim Henderson -- but the backbone of this music series since its inception is the dynamic duo who moved here in 1994 from the streets of Baltimore -- Jim Patton and Sherry Brokus, also known as Edge City (when playing in full band mode). Now THIS is a couple from whom many of us could learn a lot about the grace of living, both through Jim's songs and their warm harmonies together and through the way they encourage each other and those around them. Wherever Jim and Sherry go, there always seems to be a campfire burning, guitars playing, and love all around (even when they are playing indoors). Jim and Sherry are about to release their very first (Austin-made, that is) recording after two Edge City records that feature the whole band sound. But before we get to that, let's review a little history. Way back in 1979, Jim and his brother were playing in a band up in Maryland and this skinny blonde says she can sing and Jim's heart flutters and he breaks every rule of the band and lets her up on stage. She has never gotten off. I have to admit that my own heyday in the Baltimore-Washington area was a decade earlier, but Jim and Sherry benefitted from airplay on the legendary WHFS-FM (the first to play antiwar underground music in the Sixties) -- and as Jim notes, a single from their very first five-song EP made it all the way to No. 7 on the charts in Pleasantville, New York. Back in 1994, Butch Hancock's Lubbock or Leave It was still going strong during SXSW, and Jim and Sherry quickly found themselves surrounded by golks like Jon Dee Graham, Joe Ely, and Jimmy Dale Gilmore and the rest of the Chicago House scene that was so shortly afterward to fade away. They also befriended a tall, rangy farm-loving gal named Terri Hendrix and SHE introduced them to the amazing Lloyd Maines. Lloyd then produced Edge City's first Austin CD, "Mystery Ride," the cover of which includes the band's motto, "Music for those of us who never joined up!" And, yes, that IS a takeoff on the Maryland state flag on the jacket! Players on that disc included David Grissom on guitar, Darcie Deaville on fiddle and mandolin, Glenn Fukunaga on bass, Paul Pearcy on drums, and Chip Dolan on keyboards and accordian -- also featured is Jim and Sherry's daughter Meaghan on harmony vocals (another long story). And, of course, Lloyd himself on lots of music makers. The second Edge City CD was "Keepers of the Flame," produced by Bradley Kopp and featuring Brad on guitars, Lloyd on dobro and pedal steel, David Webb on keyboards, Glenn on bass, Freddie Steady Krc on drums, Darcie again, my pal Jon Sanchez as guest lead player on two songs, and Lorrie Singer and Brad on backing vocals. I mention these two CD's largely because they are the source of many of the songs on the brand-new "Plans Gang Aft Agley," which brings Jim and Sherry back to the folk scene that is their monthly venue once again. "Aliceanna Street" and "Finest Hour" date to the Maines recording, while the Kopp-produced CD has band-size versions of "Fortunate Man," "Somewhere Else There's a Promised Land," "Wings of an Airplane," "27 Voices," "Tonight I'm Just Thinking About You," and "Don't Say Goodbye." Songs ONLY available on the new disc include "Another Pretty Deep Hole," "Tarnished Angel," and "Son of My Father." Ron Flynt produced the new disc, which should open new doors for the laid-back couple who like to tour once or twice a year -- back up east and all over, really. But it is young Warren Hood -- NOT Miss Deaville - who is playing fiddle all over THIS recording! After running into Jim and Sherry at Flipnotics a while back, where we were all listening to tunes from Mary Battiata (an old friend of theirs from their Baltimore-Washington daze) and the amazing Michael Fracasso (whose new songs may even surpass his older standards), we got together over at Austin Java for a brief conversation that lasted all evening. Jim talked about his approach to the craft - write great songs and make great records are his goals - and about the reality that his songs are stories that are woven from events in his own life and then camouflaged so as to make them universal. He also called his songs snapshots taken from all different angles -- but folks, he is using a unique lens. Sherry, by the way, has a huge career outside music. Trained as a psychological therapist, she has served the homeless and addicted populations of the streets of Baltimore, the displaced people of New Orleans and surrounding areas after Katrina, and children of all ages who have a history of abuse. No wonder she sings with such compassion and has such a good listening ear. "Fortunate Man" is in a way Jim's signature song -- I have the fairest of lovers, and I have the truest of friends ... And I have a dream still inside me, and I've got this guitar in my hand ... Measured by that, I am a fortunate man.... " But of course, Jim HAS such good friends because he has been a good friend. "Aliceanna Street" features Sherry's rich vocals (Carol Young of the Greencards sounds a little like Sherry), and talks about being "stuck without a choice" in a hardscrabble life in the big city. In "Promised Land," Jim tells of a dad who started work at Bethlehem Steel at the age of 16, got married the same year and had a kid -- whom he encourages to get out of here as soon as you can because SOMEWHERE ELSE there's a promised land. BUT the kid did not listen? "Finest Hour" also features Sherry -- and Mister Hood. "Stand" is about the love between a couple through tough and good times -- and the great value of turning "instant love" (as Jim called his first glance at Sherry) into a long-term commitment to each other. Life is complicated, but the rewards of overcoming life's difficulties, at least for these two, have been great! Flanfire sez: Listen to the whole CD, then listen to Jim and Sherry live, then have lunch or a cuppa coffee with them -- and laugh and cry and walk all over Kerrville and Baltimore and even Austin's hills and valleys with them. You'll be a better and happier person for it. FOOTNOTE: I have to mention that Michael Fracasso pulled out a 30-year-old song from his youth at the Flip's show -- Gail -- that just washed out all my interest in hearing 1962 or any of the classics that are so deeply ingrained in my spirit. Then there was the biting, "There Goes the Neighborhood!," and "Hurricane," and on and on and on --- and especially the absolutely amazing, "Red White and Blue," a song ostensibly about the Civil War but much much deeper. There were only about seven hundred too few people at this Fracasso show -- Austin had best not forget its real superstars -- and Fracasso is one of the very few people ANYWHERE who could (if he chose) cover Roy Orbison well. Three of my oldest friends in this fair city have just released new product -- and have shows lined up in the very very very near future. Let's start with Kris Brown and Mr. Brown and DubKids (PJ Herrington and Diedrich Jones, Mr. Brown's homeboys from Cincinnati). OCTOBER 11 they play at the Rebar in San Antonio, October 12 in San Marcos -- and then the band is on the road in California with four nights at the second annual Las Tortugas Dance of the Dead Halloween Celebration in Yosemite Park plus some other Golden State gigs. Then it's back to Stubbs in Austin and a couple other local shows before the boys head north for their Midwest tour. All of this touring is in support of the long-awaited "Boderation" CD, produced by Courtney Audain at Coinhead Studios in NORTHeast Austin. Now, the live show lineup these days includes the DubKids (PJ on guitars, Diedrich on vocals), Jerome King on organ and Rhodes, Charles Phillips on percussion, and Paul Mills on drums -- none of whom are on the CD. The live band does include Michael Rubin on harmonica, Mark Wilson on tenor sax and flute, Ray Ray Strucker on trumpet (and trombone), and of course Mr. Brown himself mostly on bass and vocals. And folks this is the real reggae -- complete with Jamaican accenting from Mr. Jones -- but with a twist. Lots of other players dot the studio recording, from Audain himself to DJRJ and Daniel Serrato on drums, Claude McCan on keyboards, Ed McNames on trumpet, Rich Restaino on bass here and there, plus backing vocals by the likes of Shelley King, Leeann Atherton, and Michael Hale. Okay there are really NINE songs plus dub tracks of three of them -- but what songs! The CD opens with the title track, Boderation, which is a stepped-up dirge so reminiscent of vintage reggae antiwar music that you believe you are hearing the song for the millionth time and still waiting for men to lay down their swords and live in peace -- "we don't judge a man by his complexion." It is also the only song that may not keep you on your feet dancing the night away. "Don't Stray Far" from the sidewalk is a bouncy tune, and then there is "Knock Knock," a love song (Mr Brown style). "Moving" also makes us want to dance. My favorites here are "Not Study War," "They're Dancing," and the wonderful "Rubadub." The first features the great horn section and great harmony vocals -- this is an impassioned plea for peace and even moreso for feeding the hungry and ending the misery and violence that plagues so many in this life. "Creator's love will come shining through" ... when we ... "study war no more." "Rubadub" is yet another song of praise and love to God -- "scrub my soul down till there's nothing left to scrub...." And "They're Dancing" starts with a mention of willow leaves in the spring and planets and moons hanging out in space, even electrons and atoms-- and all of them are dancing. There is no bitterness or cynicism in this music -- it is pure joy that focuses on turning hearts toward "the way." Then of course there is "Vicious Circle," with the horns again out front but also a great harmonica solo from the newlywed Michael Rubin-- is it really just the 2,000 miles that is keeping these lovers apart? I must have woke up on the "Wrong Side" of the bed, sings Mr. Brown, perhaps the most personally revealing number on the disc. And then (for those who understand this dub stuff) there are dubs of Don't Stray, Wrong Side and Not Study War. Kris Brown has long been a great friend and one of my favorite players in Austin -- and Boderation is a very good "sampling" of his great music -- but go to the live shows with broken-in shoes (or none at all?) -- and keep hydrated as you dance ALL NIGHT LONG! Next up on the week's bill is the Texas Sapphires, headed up by twin (in more ways than we can count) crooners Brent Malkus (who also plays great guitar) and the lovely Rebecca Lucille Cannon (of Sincola fame). The new CD here, "Roadhouse Gems," was recorded live at John T. Floore Country Store outside San Antonio (well, except for two add-on songs cut for ME TV). You will find much of the band's earlier studio CD here, along with one new Malkus song --"Stunt Double" -- and special covers of "Cigarettes and Coffee Blues" (Marty Robbins) and "Tonight the Bottle Let Me Down" (Merle Haggard). Other players here include Bobby Daniel on bass, Eric Tucker on drums, the young superstar Nathan Fleming on pedal steel, and Bawb Dawg Pierce on mandolin and banjo. The CD is part of the "live at floores" concert series, and in truth I need to listen a few more times but have to get in the fact that the Sapphires have a major CD release at the Continental Club on Friday, October 12 -- opening at 10 for Eleven Hundred Springs and the LEGENDARY Charlie Louvin. Shelly Knight used to be a top-drawer DJ here in Austin (95.5 FM) and beforehand in New Orleans -- but being cramped up in a studio was not her idea of heaven. The Living Dead band includes Andrew Wood on drums, former hubbie Eric Leikam on bass, and current man-friend Fred Schultz on hot hot hot guitars. I went to their CD release at Ruta Maya last week and was very pleased with the significant upgrade in their live show and their performance level. Folks, this is pure and unadulterated rock and roll -- complete with Shelly lying flat on her back at the end of songs (no jumping into the smallish crowd at Ruta Maya, though) and Fred's guitars just screaming (but at a very nice volume). There are eight songs on the disc -- lovingly titled "II." I am a little too close here to write objectively about the lyrics -- but who really cares about navel pondering when the rock and roll is just pouring off the stage? And Shelly has never looked (or sung) better -- must be those HAAM promos with the handsome Antone! And here is the real hoot of the night. Shelly and her boys will grace the Momo's stage on October 20th to celebrate her debut as a calendar girl for the 2008 "She Rocks" calendar (racy, racy, but the proceeds go to great charities). Photos of course by Ricardo Acevedo. Also on the bill -- Velvet Brick, Full Stride, and one of my personal favorites, HOPE IRISH (and if you have never seen this woman, all I can say is Pamela Anderson is not as pretty nor as funny nor as musically talented. Hope Irish is brave and outrageous and yet sweet and just wonderful. Sophie -- and All That Jazz! Sophie with Ally Means; Sophie with Bryce Clifford. Brad Clifford came all the way from Toronto to play drums with his pals in Austin. Also on the bill -- Clint Myers from Youngmond Grand; Graham Weber; Slowtrain; the lovely Nicolette Manglos; Erin Ivey; and others too numerous to list. 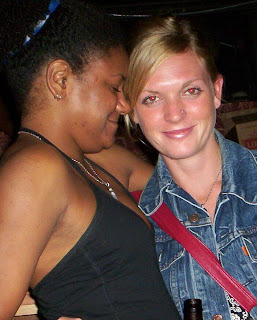 Sophie Nicholls, loved by many in Austin, is a Toronto woman now living in Accra, Ghana, on an 8-month assignment from Journalists for Human Rights. She will regularly report on what she is learning about life in Africa. Sophie Fest was, according to organizer Bryce Clifford, a rousing success -- maybe not the BIG fundraiser that took place up in Toronto a month earlier, but everyone had a blast and got to hear some special music. Biggest surprise of the evening was the amazing set from Clint Myers of Youngmond Grand -- who JUST HAS to do more solo shows. Another special treat was Erin Ivey, whom I later in the week saw with her jazz duo, Grand Hotel (see below). Nicolette Manglos is a pianist whom we know through B. Sterling Archer of Faultline for Now (BTW, FFN is playing the Troubadour on October 11th), and Graham Weber is such a cool guy. Slowtrain and Bryce Clifford and his band rounded out the bill -- and, yes, Ihave left out two or three others who graced the fair Sophie with their talents. Also in the house -- just visiting -- were Kat Edmonson and her piano player, Kevin Lovejoy. So naturally, I took the cue and went over later in the week to Club One 15 to see Grand Hotel -- and Erin (who had been casually dressed for the Scoot Inn Sophie show) was all decked out in this BLUE DRESS and singing these torch songs and being sultry and sweet all at the same time. Pianist Rolh Ordahl was as advertised -- SMOKIN! Gotta see more of this stuff. Songs included "This Sporting Life," "Am I Blue?," and "Summertime" -- and I had to leave early! Later that same evening (yes, the same one during which I saw the Daze! ), it was over to the Elephant Room (where I got a seat up front thanks to my great pals Doc and KK who had to leave early and later shared a table with Jane Bond and Chad Tracy) to see Kat and her jazz quintet (herself included). The aforesaid Kevin Lovejoy was on piano and a little more, plus Chris Maresh (one of Austin's best sidemen, sez the Austin American-Statesman this week) on bass, Rob Kasonell (who hails from Montreal) on drums, Sydney, Australia's Sam Lipman on saxophone, and of course Miss Kat herself on vocals -- and what vocals. Songs ranged from "Bye Bye Blues" to the Beatles' "Michelle (My Belle)" to the great Peggy Lee standard "Fever" -- but my personal favorite was the Henry Mancini standard, "Charade," which Kat just KILLED! Kat Edmonson with Sam Lipman on sax and Kevin Lovejoy on piano; Rolf Ordahl with Erin Ivey at Club One 15. October 6 -- 9 pm. The DAZE at Momo's. Be there. Or just wait till their Halloween gig at Antone's (if you read this late!). Okay. Forget that singer-songwriter and lead guitarist (he plays harmonica and keyboards here and there, too) Evan Butts is "just" a freshman in college (or that bassist and sometimes mandolin player Chris Ritchie is, too) -- and ignore that fact that drummer Aaron Lemke (still in high school) draws other drummers to watch his work. Chris Sibley sits in; Evan Butts of the DAZE! The DAZE can play -- and more than just that, they are learning how to entertain. On a night a few weeks back at Ruta Maya, the DAZE headlined the monthly Sprocket Productions showcase -- and I highly recommend this series, which features bands whose members are 18 and under. Butts is a gifted songwriter who is tackling big picture themes -- as evidenced in songs like "Come, Child" and "Tide of Seasons," both of which remind old fogies of the best Led Zeppelin "ballads." The boys can play the blues (who doesn't here in Stevie Ray-land? ), but they are also willing to stretch their own limits (and the audience's musical tastes) with sounds that perhaps Butts learned from guitar teacher Rick del Castillo. The highlight of the evening had to be an extended samba jam featuring guest performer Chris Sibley on percussion box in which every member of the band found a way to bang a gong or some other instrument to keep up with the incredible pace and energy Sibley was creating on stage. But the Daze was hardly the only show going on at Ruta Maya that evening. Earlier (I missed them), Sprocket had brought out The Bubbles and Girl in the Closet, and the grand finale (before the kids were run off the stage for a reggae festival) featured Althea Soucie-Garza and her new band, An Even Three (or just AE3) -- Griffin on drums, Taylor on guitar, and Jackson on bass. To tell the truth, there is no way to review this show, because the band was rushed on and off the stage. But one thing is certain: the flanfire review of Althea's old band Joyride (featuring three members of Blues Mafia -- see July 2006 postings) was right on the money. I did enjoy the work being done by her colleagues, but I am so eager to hear Althea in an acoustic set showcasing her folk-blues voice (as opposed to the rock-blues she has been doing). Fourteen months from my earlier review I for a second time pronounced that Althea is the second coming of Maria Muldaur (one of my lifelong personal favorites) -- and somehow it just feels that the louder players would tend to drown out her unique and mature beyond her years voice and (for that matter) musical sensitivities. But so what? Althea is 14 years old and just learning how to deal with high school life. Let her have her fun with her age mate friends, and in time they, too, may be graduating (sic) to the acoustic music that seems made for this amazingly gifted person. We don't need any burned out over the hill teenagers in THIS town -- and Althea and all of the other very gifted and talented teen-aged musicians in Austin can just relax and develop their skills without all of that idiotic Hollywood pressure to make some old fat cats rich while they end up in rehab. SO if you are a music lover, you might just trek on down to Ruta Maya on October 27th for the Sprocket Productions Halloween Bash.